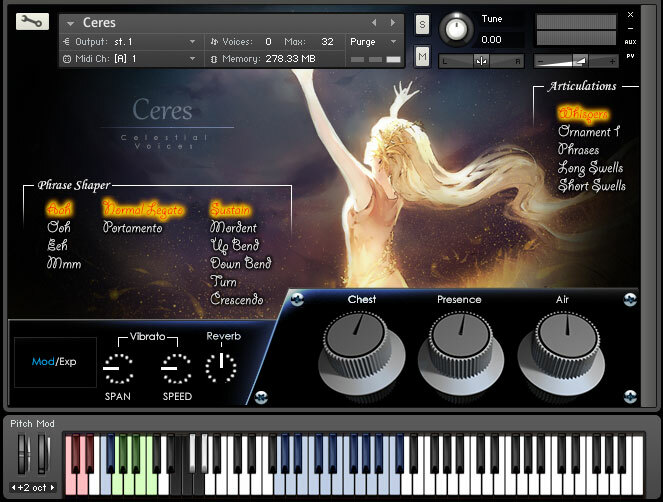 Ceres is the first of the Celestial Voices, by Auddict, featuring the soaring, ethereal vocals of singer, Tanya Wells. Tanya's flawless vocals, trained and refined in India, have taken her performing at the Cannes Film Festival for Anoushka Shankar, opening for Joss Stone, Nitin Sawhney and Nicki Wells (her twin sister), as well as recording vocals for the 2014 movie "Hercules". With this VST instrument, we aimed to capture as much of Tanya's tone, style, artistic sound, and versatility in performance as we could, and as a result, you need only look at the screenshot below. Have a look at the range of the instrument, and then take a glance at the number of keyswitch notes available to you. Multiply these together, and you will have a rough idea of how deep and versatile this instrument really is. We wanted to make this instrument even more musical, so we came up with the idea of the phrase builder module. Something which we hope to develop and add to more and more as we continue to produce sample libraries. With the phrase-builder, which you can see in the Kontakt interface, you can shape your musical phrase by using a key-switch to determine how the first note of a phrase will be sung. This stems from the fact that, in a recording session, you might say to the singer; "can you just sing that opening note with a crescendo", or "with a little grace note", and they would do it - musical freedom. We want you to have this kind of freedom with our sampled libraries, so we have implemented different sounds that you can begin a phrase with, after which, the rest of the legato phrase will continue on with normal sustained notes. You can also switch as you play, between normal legato intervals, and portamento intervals, each individually sampled for all four vowels, giving a total of eight true legato sounds, as well as adding touches of vibrato in with the controls (MIDI map-able), to add an extra level of depth, variety and belief to your sound. Long & Short Swells - True sampled crescendo/diminuendo samples, timed together so you can play polyphonic-ally, and the dynamics of each sample will remain perfectly matched throughout. These are perfect for adding a real expressive, human sound to your music. This instrument requires the FULL VERSION of Kontakt 4, or above (so it will also run in Kontakt 5 perfectly). The full version of Kontakt 4, is not the free "Kontakt Player", which can be downloaded, it is the full retail version which can be purchased from Native-Instruments' website. The compressed files to be downloaded take up 3GB of space, and you will need an additional 4GB to extract the files on your computer. We use Kontakt's in-software compression (.ncw files), which further reduce the file size, allowing for quicker and smoother downloads, and take up less space on your hard drive. All prices shown are excluding VAT and/or other applicable sales taxes. If applicable, these will be added during the checkout process.